Renal filtration of small solutes and water without loss of larger molecules is intimately linked to the glomerular basement membrane and the slit diaphragm between interdigitating podocytes. Alterations of these structures, either acquired or hereditary, commonly lead to proteinuria. Hereditary nephrotic syndromes are a heterogeneous group, displaying severe proteinuria and renal failure. Best-characterized is the congenital nephrotic syndrome of the Finnish type, caused by mutations in NPHS1, the gene encoding nephrin. Affected individuals exhibit massive proteinuria in utero and nephrosis at birth (1). Nephrin is an integral membrane protein located at adjacent sites of secondary foot processes of podocytes, a specialized epithelial cell that ensures size and charge selective ultrafiltration (reviewed in reference 2). The precise function of nephrin is unknown; however, it appears to form a zipper-like filter structure within the approximately 40-nm-wide slits between two foot processes (3). In mice, the deletion of NEPH1 causes severe proteinuria and perinatal death (4). Like nephrin, NEPH1 is a transmembrane protein of the Ig superfamily expressed by podocytes and localizes to the slit diaphragm by electron microscopy (5). The extracellular domain of NEPH1 contains five Ig domains and the integrin recognition motif RGD. The third Ig domain is similar to the PKD repeat found in polycystin-1, an evolutionary distinct Ig-like fold that appears to mediate strong homophilic interactions (6). Deletion of either nephrin or NEPH1 causes an almost identical phenotype in mice (4,7 ⇓); therefore, it has been speculated that nephrin and NEPH1 participate in identical or overlapping pathways. In Drosophila, the nephrin- and NEPH1-related proteins hibris (Hbs), kirre/dumbfounded (Duf), irregular chiasm-roughest (IrreC-rst), and sticks and stones (Sns), have been implicated in myoblast fusion and myotube guidance (8). Human nephrin is most closely related to Sns (28% identities) and Hbs (28% identities), whereas NEPH1 is more closely related to Duf (33% identities) and IrreC-rst (31% identities). Interestingly, the deletion of Sns, or combined deletions of Duf and IrreC-rst, abrogate myoblast fusion (9), whereas ectopic overexpression, but not deletion of Hbs, affects muscle development (8). Furthermore, S2 cell aggregation assays revealed a heterotypic interaction of Hbs and Sns with Duf, indicating that the interaction between these proteins may be crucial for muscle development in Drosophila. These findings prompted us to speculate that NEPH1 is a structural component of the zipper-like structure formed between opposing podocytes (3). To identify ligands of NEPH1, we generated a NEPH1 Ig fusion protein (NEPH1.ec.Fc) and used this fusion protein to stain renal tissue. 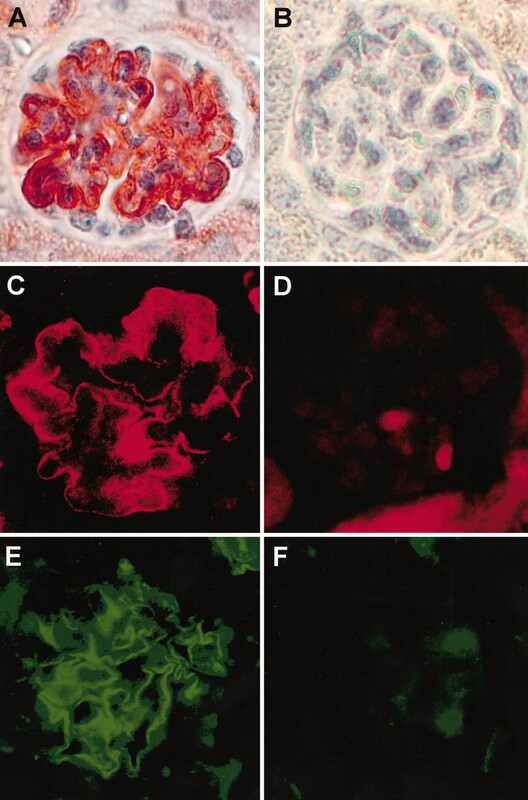 The NEPH1.ec.Fc fusion protein specifically recognized an antigen along the glomerular capillary wall, closely resembling the staining pattern obtained for NEPH1 and nephrin. This result led to the hypothesis that NEPH1 and nephrin may form homodimeric and heterodimeric interactions at the slit diaphragm of glomerular podocytes. 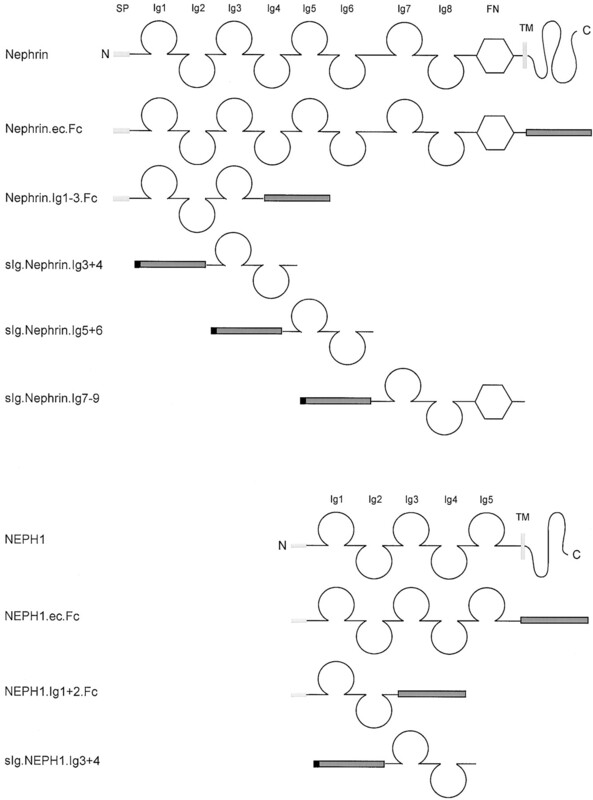 Full-length nephrin and NEPH1 cDNAs were recently described (10,11 ⇓). The Fc fusion proteins contain the CH2 and CH3 domain of human IgG. The control protein sFc.7 contains the leader sequence of CD5, followed by the CH2 and CH3 domain of human IgG, and the membrane anchor of CD7. In the sFc fusion proteins, the CD7 anchor was replaced by NEPH1 or nephrin sequences as indicated. All truncations were generated by PCR, and verified by automated sequencing. To generate Nephrin.ec.Fc and Nephrin.Ig1–3, the 5′-oligonucleotide 5′-CGCGGGAAGCTTGCCACCATGGCCCTGGGGACGACGCTCAGGGCTTCTCTCCTGCTC was used with the 3′-oligonucleotides 5′-CGCGGGCAGATCTGAAGGTGGCTCTGTGGGCAG and 5′-CGCGGGCAGATCTTTCTGGGCGGGATAT TTTAC, respectively. The 5′-oligonucleotide 5′-CGCGGGCGAGATCTGGGATCTGCATCCCAG and the 3′-oligonucleotide 5′-CGCG GGGCGGCCGCGCTAGATCGTCACGTTAGTTGG were used to generate sFc.Nephrin.Ig3+4, the 5′-oligonucleotide 5′-CGCGGGCGAGATCTGGCCAACGCATCCGCA and the 3′-oligonucleotide 5′-CGCGGGGCGGCCGCAGACTATGTCCACAG AA were used to generate sFc.Nephrin.Ig5+6, and the 5′-oligonucleotide 5′-CGCGGGCGAGATCTCCAGGACCCCACTGAG and the 3′-oligonucleotide 5′-CGCGGGGCGGCCGCCAGAAGGCTGGTGGAGA were used to generate sFc.Nephrin.7-9. NEPH1.ec.Fc and NEPH1.Ig1+2.Fc were generated using the 5′-oligonucleotide 5′-CGCGGGAAGCTTGCCACCATGACTCTGGAGAGCCCT and the 3′-oligonucleotides 5′-CGCGGGCGGATCCACAGGTAACACCTCTCGCTC and 5′-CGCGGGCGGATCCACATCAAGCTCAATGGATGT, respectively. The 5′-oligonucleotide 5′-CGCGGGGATCCCAATGGCAAGGAGACA and the 3′-oligonucleotide 5′-CGCGGGGCGGCCGCGCTAGGCCCGGCAGGTATAGGTGCCAGC were used to generate sFc.NEPH1.Ig3+4. The domain structures of Nephrin and NEPH1 were predicted using the programs SMART (http://smart. embl-heidelberg.de) and motif scanner (http://scansite.mit.edu/). The NEPH1 antiserum has recently been described (11); the M2 anti-FLAG was obtained from Sigma-Aldrich (Taufkirchen, Germany). A stable cell line, expressing the NEPH1.ec.Fc fusion protein, was established using the pLXSN retroviral vector system as described earlier (12). In brief, the retroviral vector was produced by cotransfection of HEK 293T cells with three plasmids (2.5 μg of pMD-G, 7.5 μg of pMD-gp, and 10 μg of the retroviral transfer vector containing NEPH1.ec.Fc) using the calcium phosphate method. The supernatant was harvested after 3 d, centrifuged, filtered, and applied to COS M6 cells in the presence of 8 μg/ml polybrene for 4 h. Transduced cells were selected 3 to 4 d after viral transduction in neomycin (500 μg/ml). To purify the secreted NEPH1.ec.Fc fusion protein, supernatants were harvested after 10 to 14 d, centrifuged, filtered, and applied to an anti-human IgG column (ICN Biomedicals, Eschwege, Germany). Bound protein was eluted using 0.1 M glycine (pH 3.0), neutralized in TRIS-buffer, and dialyzed against PBS over night. Concentrations were determined photometrically at 280 nm and by an ELISA using goat-anti human IgG (ICN Biomedicals) coupled to 96-well ELISA plates (Greiner GmbH, Frickenhausen, Germany). Coimmunoprecipitations were performed as described (10). Briefly, HEK 293T cells were transiently transfected using the calcium phosphate method. After incubation for 24 h, cells were washed twice and lysed in a 1% Triton X-100 lysis buffer (20 mM Tris-HCl, pH 7.5; 1% Triton X-100; 50 mM NaCl; 50 mM NaF; 15 mM Na4P2O7; 0.1 mM EDTA; 2 mM Na3VO4; and protease inhibitors). After centrifugation at 15,000 × g (15 min, 4°C) and ultracentrifugation at 100,000 × g (30 min, 4°C), cell lysates containing equal amounts of total protein were precleared with protein G-sepharose and then incubated for 1 h at 4°C with the appropriate antibody, followed by incubation with 30 μl of protein G-sepharose beads for approximately 3 h. The beads were washed extensively with lysis buffer, and bound proteins were resolved by 10% SDS-PAGE. For endogenous interaction, eight mouse kidneys were homogenized using a glass potter, cleared by centrifugation, and solubilized in lysis buffer supplemented with 20 mM CHAPS and 3 mM ATP. Before immunoprecipitation, cellular lysates were further precleared by ultracentrifugation and absorption to protein G beads. All kidneys were freshly prepared and perfused in situ with ice-cold phosphate-buffered saline before lysis. Control samples were either incubated with a nonspecific rabbit antiserum before immunoprecipitation or with protein G beads alone. For pull-down experiments HEK 293T cells were transiently transfected, harvested, and lysed as described above. Lysates were precleared and incubated with the recombinant protein (10 μg) for 2 h at 4°C followed by incubation with 30 μl of protein G-sepharose beads for approximately 3 h. As in coimmunoprecipitations, the beads were washed with lysis buffer, and bound proteins were resolved by 10% SDS-PAGE. HEK 293T transiently overexpressing NEPH1.ec.Fc were harvested, washed, and lysed as described above. The fusion protein was immobilized from lysates using G-sepharose beads. For each reaction, 30 μl of immobilized protein were added to 10 μl of 5× assay buffer (250 mM NaHPO4, pH 7.5) and 2.5 μl of denaturation buffer (2% SDS, 1 M β-mercaptoethanol) followed by incubation at 95°C for 5 min. After cooling down, 2.5 μl of Triton-X100 were added to each tube together with 2 μl N-glycosidase F (PNGase F, Calbiochem, Bad Soden, Germany) for the test samples, and 2 μl H2O for the controls. After incubation at 37°C for five hours, deglycosylation was verified by monitoring the size-shift on a 10% SDS-PAGE. Frozen mouse kidneys were embedded in OCT, cut into 5-μm sections, and fixed with ice-cold acetone for 2 min before staining. The blocking solution was 10 mM TRIS-HCl (pH 7.4), 100 mM MgCl2, 0.5% Tween 20, 1% bovine serum albumin, and 5% fetal calf serum, the washing buffer was PBS containing 0.04% Triton-X100 and 0.35% DMSO. All incubations were performed in a moist chamber at room temperature. For indirect immunoperoxidase stainings, we used the Vectastain ABC kit (Vector Laboratories, Burlingame, CA) following the manufacturers’ protocol. Endogenous peroxidase activity was quenched with 0.3% H2O2 for 30 min. Fusion protein staining was performed by incubating cryosections with NEPH1.ec.Fc at 20 μg/ml for 1 h, followed by incubation with FITC-goat anti human (ICN). Controls were incubated with identical concentrations of human IgG. For paraffin sections, tissues were fixed with methanol/DMSO (4:1 vol/vol) at 4°C over night, dehydrated, paraffin-wax embedded, cut into 5-μm sections, mounted on Super Frost Plus slides (Menzel, Braunschweig, Germany), dewaxed, and rehydrated. For all NEPH1 stainings, the antiserum was diluted 1:10. To improve antibody penetration and antigen recognition, paraffin sections were boiled in 10 mM citric acid for 5 min. An Axiophot 2 microscope (Zeiss, Jena, Germany) equipped with a CCD camera was used for image documentation. To characterize the ligand of NEPH1, we generated Ig fusion proteins that contained the extracellular domain or single Ig domains of NEPH1 and nephrin fused to the CH2 and CH3 domain of human IgG (Figure 1). To ensure correct glycosylation of the NEPH1 fusion protein containing the entire extracellular domain of NEPH1 (NEPH1-ec.Fc), the fusion protein was affinity-purified from retrovirally transformed COS M6 cells or transiently transfected HEK 293T cells (Figure 2). Frozen sections of mouse kidneys were incubated with NEPH1.ec.Fc or an identical concentration of human IgG. As shown in Figure 3, the NEPH1 fusion protein, but not human IgG, specifically outlined the glomerular capillary wall, using immunohistochemistry or indirect immunofluorescence. The NEPH1 fusion protein labeled the mouse glomerulus in a staining pattern identical to NEPH1; we therefore speculated that the NEPH1 fusion protein binds to NEPH1 at the glomerular slit diaphragm. Figure 1. Generation of nephrin and NEPH1 fusion proteins. The Ig and fibroncectin (FN)-like domains were predicted using the SMART prediction program (http://smart.EMBL-Heidelberg.de/). All constructs containing the amino-terminal domains of either NEPH1 or nephrin include the authentic signal peptide (SP). The carboxy-terminal Ig domains were fused to the carboxy-terminus of the CH2 and CH3 domain of human IgG. To target these constructs to the secretory pathway, the fusion proteins were preceded by the leader sequence of CD5 (black box) (10,11 ⇓). The constructs Nephrin.ec.Fc and NEPH1.ec.Fc contain the entire extracellular (ec) domain of either nephrin or NEPH1. Using wild-type NEPH1 in combination with either NEPH1.ec.Fc or Flag-tagged NEPH1, we tested whether constructs containing the extracellular domain of NEPH1 can precipitate full-length NEPH1 from transiently transfected HEK 293T cells. We used two control proteins, sFc.7, a fusion protein containing the CH2 and CH3 domains of human IgG (10,11 ⇓), and PKD.Fc, a fusion protein containing amino acid 1 to 480 of the N-terminal domain of polycystin-1 (13), including the first PKD repeat, and the CH2 and CH3 domain of human IgG. PKD repeats are Ig-like domains present in the extracellular domain of polycystin-1 (13) and mediate homodimeric interactions (6). While the NEPH1-Ig fusion protein (NEPH1.ec.Fc) precipitated full-length NEPH1, both control proteins failed to immobilize NEPH1 using identical detergent and washing conditions (Figure 4). In several cell surface receptors of the Ig superfamily, the ligand binding area can be mapped to a linear motif, often located at the N-terminus of the molecule. To test whether the N-terminal two Ig domains mediate the NEPH1-NEPH1 interaction, we generated fusion proteins containing the two N- or two C-terminal Ig domains. These Ig domains were fused to the N- or the C-terminus of human CH2 and CH3. As shown in Figure 4A, both fusion proteins were sufficient to precipitate NEPH1, but a similarly constructed control protein failed to interact with NEPH1.F. These results suggest that the homodimerization of NEPH1 molecules is not mediated by a linear peptide motif, but most likely involves multiple contact sites along the entire extracellular domain of NEPH1. The targeted deletion of either NEPH1 or nephrin in mice is characterized by heavy proteinuria and death in the early perinatal period. These almost identical phenotypes suggest that both molecules have similar or overlapping functions. We therefore tested whether NEPH1 and nephrin form physical interactions. As demonstrated in Figure 4B, the NEPH1-Ig fusion proteins precipitated nephrin containing a C-terminal Flag-tag. Furthermore, a nephrin-Ig fusion protein containing either the full-length or truncations of the extracellular domain of nephrin precipitated Flag-tagged NEPH1 (Figure 4C). These findings indicate that NEPH1 and nephrin can engage in heterodimeric interactions. However, the interaction is surprisingly promiscuous, involving different Ig domains of both molecules. Nevertheless, immunoprecipitation of nephrin from mouse kidneys with anti-nephrin antiserum, but not with normal rabbit antiserum, precipitated a band at the predicted size of NEPH1, suggesting that the interaction between nephrin and NEPH1 is present in vivo (Figure 4D). This interaction was only detectable after solubilization of kidney lysates with 20 mM CHAPS, indicating that a substantial fraction of both proteins is associated with lipid rafts. Addition of 3 mM ATP to the lysis buffer appeared to increase the amount of NEPH1, precipitated with anti-nephrin antiserum versus protein G alone (Figure 4D, lower panel), indicating that association with both lipid rafts (14) and the cytoskeleton (15) reduces the solubility of NEPH1 and/or nephrin and limits the experimental approaches to verify this interaction in vivo. It has been proposed that the electron-dense central region of the slit diaphragm is formed by interdigitating nephrin molecules that span the distance between two neighboring podocyte foot processes. Using coimmunoprecipitations of transiently transfected proteins, we tested whether the nephrin fusion protein immobilizes wild-type nephrin. As demonstrated in Figure 5, the nephrin-Ig fusions precipitated membrane-anchored, Flag-tagged nephrin. Again, this interaction was not confined to a specific Ig domain of nephrin. These findings confirm that the Ig domains of NEPH1 and nephrin form promiscuous homodimeric and heterodimeric interactions. PNGase F treatment of immunoprecipitated NEPH1 significantly decreased the molecular weight of NEPH1, revealing that NEPH1 is heavily glycosylated (Figure 6A). Correct folding of the extracellular domain of surface proteins and interaction with ligands or other surface proteins commonly requires adequate glycosylation. We therefore suspected that NEPH1 expressed in eukaryotic cells, but not bacterially expressed NEPH1, can precipitate Flag-tagged nephrin in pull-down experiments. 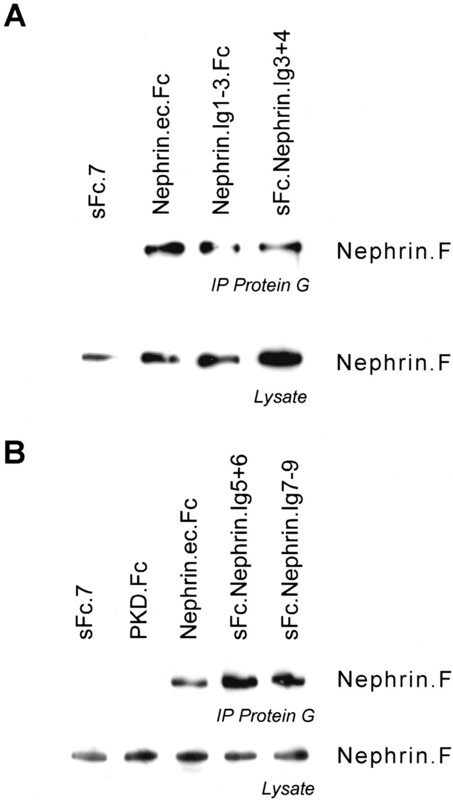 Figure 6B demonstrates that purified NEPH1-ec.Fc immobilized with protein G retains Flag-tagged NEPH1, whereas MBP-NEPH1, a maltose-binding protein fusion with NEPH1 generated in Escherichia coli, failed to immobilize either nephrin or NEPH1. Furthermore, purified NEPH1-ec.Fc expressed in HEK 293T cells, failed to immobilize NEPH1 or nephrin after treatment with PNGase F (Figure 6, C and D). These findings demonstrate that the NEPH1-NEPH1 as well as the nephrin-NEPH1 interactions require correct glycosylation of NEPH1. Several proteins, altered in hereditary nephrotic syndromes or experimental proteinuria, localize to the glomerular slit diaphragm. This structure, formed between interdigitating podocytes, together with the glomerular basement membrane and the endothelial cell layer is a filtration barrier for proteins of higher molecular weights. On the basis of electron micrographs of tannic acid-stained and glutaraldehyde-fixed rat glomerular, Rodewald and Karnovsky (16) suggested that the slit diaphragm is formed by a zipper-like organization of integral membrane proteins. The domain architecture of nephrin prompted Ruotsalainen et al. (3) to speculate that nephrin contributes to the formation of this zipper-like structure through homophilic interactions, typcial for several cell surface molecules of the Ig superfamily (17,18 ⇓). A head-to-head assembly of nephrin was suggested, postulating that the N-terminal six Ig domains of opposing nephrin molecules form interdigitating assemblies. The average length of the nephrin Ig domains was estimated at 35Å; therefore, the eight Ig domains together with the fibronectin type III domain and spacer regions of nephrin could bridge most of the estimated 35- to 45-nm width of the slit diaphragm (3). Our results presented here provide the first evidence that nephrin forms homodimers. Yet, the self-association of nephrin Ig domains was far more promiscuous than anticipated. All tested combinations of Ig domains precipitated full-length nephrin and appear to contribute to the homodimerization of nephrin molecules. Interestingly, there are several cell adhesion molecules (CAM) of the Ig superfamily that display similar properties (reviewed in references 17 and 18). For example, members of the L1 family of CAM involved in axonal growth and path finding form homodimers and heterodimers involving several Ig domain. Furthermore, several CAM that mediate neurite outgrowth, associate with lipid rafts, couple to Fyn, and activate canonical signaling cascades, thereby closely resembling some of the currently known properties of nephrin (10,19 ⇓). Type II and desmosomal members of the cadherin protein superfamily share a similar domain architecture with NEPH1, containing five tandem extracellular cadherin domains (reviewed in reference 20). Again, several intermolecular interfaces and contact sites appear to form the zipper-like superstructure typical of these cell adhesion molecules (21,22 ⇓). Although NEPH1 coimmunoprecipitates nephrin, the NEPH1 fusion protein immobilized on plastic surfaces, failed to bind NEPH1/nephrin-transfected HEK 293T, or differentiated mouse podocytes retrovirally transduced to overexpress nephrin (data not shown). Therefore, additional factors may be required for NEPH1/nephrin to mediate the cell-cell adhesion reported for the related Drosophila proteins Hbs and Duf (8). It is important to note that several cell adhesion molecules of the Ig superfamily associate with the cytoskeleton, and their adhesive strength critically depends on this interaction (18,23 ⇓). Thus, recruitment to lipid rafts and anchorage of NEPH1 or nephrin with the cytoskeleton may be mandatory for efficient homodimerization and heterodimerization. In addition, antiparallel trans interaction of dimers on opposing cells may require prior cis homodimerization or heterodimerization of NEPH1 and nephrin. Clearly, cis homodimerization is a mandatory step for subsequent trans interactions in C-cadherin-mediated cell contacts (24). It is interesting to note that the Ca2+-independent Ig-like cell-cell adhesion molecule nectin appears to utilize different Ig domains for different functions. While the N-terminal Ig domain is essential for trans-dimer formation, cis homodimerization, an essential step for subsequent trans homodimerization, is mediated by the second Ig domain of nectin (25). Although immunoprecipitation of endogenous nephrin from mouse kidneys immobilized NEPH1, this finding has to be interpreted with caution. On the basis of the comparison with other Ig CAM, we anticipate that most of the NEPH1 and nephrin molecules engaged in homogenic and heterogenic interactions are associated with lipid rafts and/or the cytoskeleton and are thus detergent-resistant (15). It is therefore possible that the small amounts of immobilized NEPH1 result from a minor fraction of protein that has not been targeted to lipid rafts. Although our findings confirm and extend some of the earlier speculations by Tryggvason (2,26,27 ⇓ ⇓), they also raise new questions. First, the interactions between NEPH1/nephrin molecules are surprisingly promiscuous and not confined to single Ig domains, suggesting that additional factors such as lipid raft recruitment and cytoskeletal anchorage may regulate the affinity and specificity of the NEPH1/nephrin interactions in vivo. Second, although homodimers and heterodimers of NEPH1 and nephrin are clearly detectable by immunoprecipitation, future work needs to demonstrate, whether these molecules can engage in trans interactions that are sufficient to mediate cell-cell adhesion. We thank L.B. Holzman for the generous gift of the anti-nephrin antiserum, O. Beltcheva and K. Tryggvason for helpful discussions, P. Stunz and B. Wehrle for expert technical assistance, and the members of the Walz laboratory for valuable suggestions. Some of our results were presented at the ASN meeting 2002 in Philadelphia, Pennsylvania. We acknowledge that similar findings were reported by L.B. Holzman’s laboratory at this meeting. This work was supported by DFG grant WA 597.